There’s a reevaluation that happens when professional runners start to creep into their 30s. Sure, a marathoner might still be in the potential prime of his or her career, but the likelihood of continuing to improve in leaps and bounds decreases significantly with age—especially when you’ve never won a big one before. 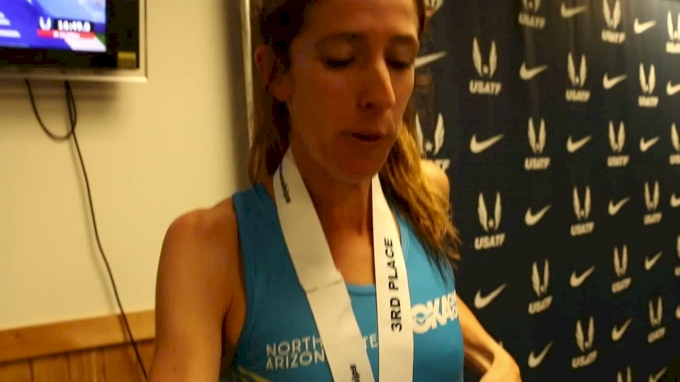 But that hasn’t been the case for Stephanie Bruce, who trains with Ben Rosario’s HOKA ONE ONE NAZ Elite training group in Flagstaff, Arizona. When the 34-year-old mother of two won the AJC Peachtree Road Race in July—which doubles as the USATF National 10K Championships—she captured the first national title of her career with a late-race surge over teammate Aliphine Tuliamuk, the defending Peachtree champion and a nine-time U.S. champion. But the addition of Tuliamuk to NAZ Elite has paid dividends for both the profile of Rosario’s group and for the fitness benefits to its members. The Kenyan-born athlete, a 13-time All-American at Wichita State who became a U.S. citizen in 2016, is a monster on the roads and was the prohibitive favorite for the Peachtree crown. Rosario told her as much before the annual fourth of July race. “Individually, I did talk to Aliphine about pushing pretty hard as she came down the hill toward 5K because, first of all, she can run downhills really well, and second of all, coming off the two national titles in May, you do get a bit of the intimidation factor,” he said. “If you can get away, sometimes people—I won’t say give up, but certainly, they are uncomfortable. She executed that very well and did push hard and create space, but when you do that, you do risk somebody hanging close enough that if you yourself end up getting tired from that push, they can get you. Bruce entered the road race flush with confidence after making her first podium at a USATF Outdoor Track Championship with a third-place finish in the 10K behind only Olympians Molly Huddle and Marielle Hall. Bruce and Tuliamuk worked out together about five times in the early part of the summer—enough for each to know about the other’s strengths and weaknesses. The summer breakthrough came after two disappointing attempts at the marathon. Two consecutive top-10 finishes at Abbott World Marathon Majors would be a huge accomplishment for many athletes, but Bruce’s 2:31 run in New York last fall and 2:32 finish in London this April left both athlete and coach feeling like she was just scraping the barrel of her potential. That lethargic feeling hit Bruce last year, too. After placing seventh at the IAAF World XC Championships in Uganda and dipping under 32 minutes in the 10K for the first time at Stanford in consecutive weeks, Bruce struggled to regain that rhythm for the rest of the spring and summer. Blood work after this April’s London Marathon revealed she has a gene, MTHFR, that does not allow her to convert folate or B12 into usable energy. To complicate matters, Bruce has had celiac disease since 2010 and is allergic to milk, eggs and soy. “Because I have celiac disease, my gut doesn’t absorb certain nutrients the same way that someone with a healthy gut does,” she says. “I’ve been trying to eat more food sources for certain vitamins versus taking the vitamins; whereas before, I was just taking B12 and folate and we found out that my body was rejecting those and actually making me feel worse because of this gene I have. With nearly 72,000 Instagram followers and 14,000 Twitter followers, Bruce has amassed one of the larger social media followings for a U.S.-based distance runner—especially for one who had never won a national title or made an Olympic team. This is mostly due to the relatable candidness of her online presence, whether it’s sharing photos of her postpartum body or anecdotes about balancing elite running with raising toddlers. Rosario sees Bruce not only as a natural maternal leader of his crew—especially for new recruits Erin Clark, Grayson Murphy, Danielle Shanahan and soon-to-be fellow marathoner Alice Wright—but as an example of how to build a brand and a platform as a pro runner. “Over the past couple years, so much of the attention Steph has gotten is from her willingness to share her journey,” Rosario said, “which is great, of course, but now what happens is when she puts up a big performance, it blows up in a bigger way than it would for others because she has this big fan base that she worked hard to create.